There is a club for everyone at the University of Maryland! Electrical and computer engineering students have many opportunities to get involved, make new connections, and have fun in their field. 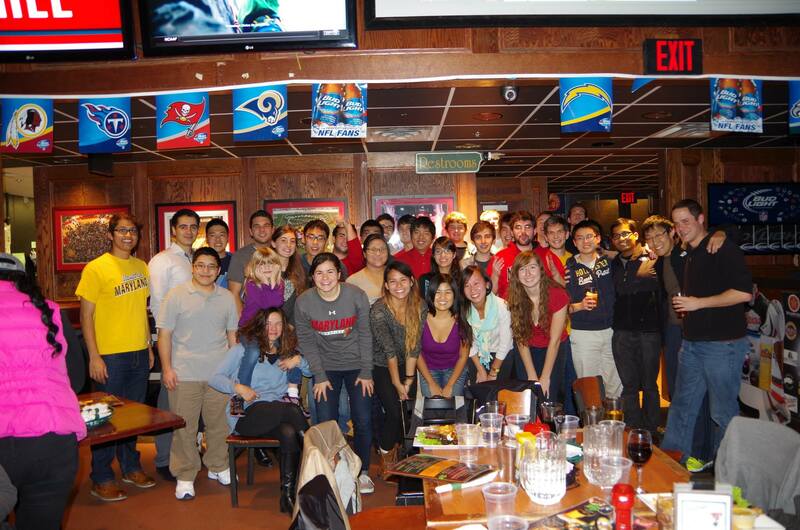 The IEEE chapter of the University of Maryland hosts many academic, social, and professional events throughout the academic year. The Cyber Security Club is a student run organization based in Computer Science and Electrical and Computer Engineering at The University of Maryland, College Park. The club's main purpose is to develop and encourage cyber and physical security awareness and application by providing students with the tools and education they need to advance their cyber security careers. To accomplish this goal, the Cyber Security Club is enthusiastic about reaching out to the community about security related topics, hosting tech talks and guest speakers, in addition to participating in security related competitions and conventions. The Electrical & Computer Engineering Graduate Student Association (ECEGSA) provides a forum for the development of social, academic, and professional activities for all students enrolled in either the MS or PhD program in Electrical & Computer Engineering. The ECEGSA coordinates social events featuring free food and fun activities, as well as weekly coffee hours. The ECEGSA’s elected officers represent the graduate student body regarding various issues of concern. The Electrical & Computer Engineering Undergraduate Student Council (USC) is an autonomous student body that plans and coordinates events and activities for ECE undergraduates each semester. The Council also provides feedback to the Department on the curriculum, facilities, student services, and other issues pertaining to the undergraduate student experience. The purpose of the EGSC is to advise the Dean on engineering graduate student issues, promote individual department events, coordinate multi-department events, create a cohesive identity for engineering graduate students at the University of Maryland, and enhance graduate student life and education through social activities and professional development. The Engineering Student Council is a non-profit educational service organization intended to better the engineer's experience at the University of Maryland, to establish a secure community for all engineering students, to promote individual society events and to coordinate multi-society events promoting engineering, to obtain a united student voice with the administration on issues of policy and curriculum, and to complete the engineering education process by instilling a sense of pride and accomplishment in the graduates. The Engineering Student Council is primarily composed of representatives from Engineering societies and elected ESC officers and chairpersons. The ESC also includes at-large students, especially those that assist with general Engineering events. Together, there are about 30-40 active ESC members that represent and serve a student body of over 3,000 undergraduate engineering students. To fulfill our mission, the ESC organizes several high-profile events for the general engineering student body. Our signature annual events include the Engineering Fall Ball, Engineers Week Celebration, and Maryland Day Design Competition. Engineers Without Borders USA is a national nonprofit organization dedicated to sustainable development through engineering assistance and training internationally responsible engineering students. Currently, the world's population is just under 6.5 billion people. In the next two decades, almost 2 billion more people will inhabit the Earth. It has been estimated that 95% of that growth will take place in developing or under-developed countries. Engineers Without Borders believes that engineers have an important role and responsibility in solving these global problems. Eta Kappa Nu is the International Honor Society for Electrical Engineers. There are over 200 chapters in the United States, Europe, and Asia. Student in the upper fourth of their junior class or upper fifth of their senior class can be elected to Eta Kappa Nu. Graduate students and professional engineers are also eligible. Eligibility depends on scholarship, personal character, voluntary services, and distinguished accomplishments. For undergraduates, the most important qualification is scholarship during the first years of college. The IEEE is a non-profit, technical professional association of more than 365,000 individual members in approximately 150 countries. Through its members, the IEEE is a leading authority in technical areas ranging from computer engineering, biomedical technology and telecommunications, to electric power, aerospace engineering and consumer electronics, among others. The Leaders of ECE program is meant to build community in the ECE Department and to gather a group of student leaders to offer advice and support to the Chair on recruitment issues and important departmental matters. The program seeks talented and engaging students who have the ability to interact well with their peers and show leadership within the Department. Nominees are selected by staff and faculty in the ECE Department. Leaders of ECE are occasionally asked to serve as departmental ambassadors, specifically for recruitment activities for prospective students. The purpose of this student-to-student interaction is to offer incoming students an opportunity to ask questions about the value of majoring in electrical or computer engineering, and to make them feel more comfortable by speaking to peers about experiences in the Department and what to expect when they arrive on campus. Leaders of ECE will also be asked to offer advice to the Chair on key issues and departmental initiatives at occasional meetings or informal focus groups, or over lunch. Leaders of ECE are also asked to reach out and connect with fellow students to build community and offer new ideas on how we can make our Department a better place for undergrads. SWE is an active group of students, both undergraduate and graduate women—and, yes, men too—that supports women (and men) in their pursuit of a career in engineering. The organization also encourages women engineers to attain high levels of education and professional achievement. The Maryland Solar Decathlon team consists of eager, intelligent, insightful, committed students from a variety of disciplines including architecture; mechanical, electrical, environmental, and aerospace engineering; computer science; economics; English; and landscape architecture. The leadership structure is designed to be all-inclusive, to incorporate both the academic and professional worlds, and to listen to voices both experienced and fresh. To accomplish this, the team has a three-part leadership structure, featuring student leaders, faculty advisors, and mentors. In the 2007 Solar Decathlon, the University of Maryland's solar LEAFHouse took 2nd place overall and 1st in among U.S. teams, and won the People's Choice award for the second time in a row. In 2016, UM's LEAFHouse took 2nd Place, 1st Among U.S. Teams. Tau Beta Pi is the only engineering honor society representing the entire engineering profession. It is the nation's second-oldest honor society, founded at Lehigh University in 1885 to recognize students of distinguished scholarship and exemplary character. There are now collegiate chapters at 229 US colleges and universities, active alumnus chapters in 16 districts across the country, and a total initiated membership of 477,586. Maryland Beta Chapter was founded in 1929. Maryland Beta is an active chapter, carrying out a full program of activities. Since the establishment of the R. C. Matthews Outstanding Chapter award in 1956, Maryland Beta has received the award 12 times, and has received 16 honorable mentions. The honors bestowed upon our chapter not only recognize the high caliber of past and present Maryland Tau Bates, but also impose an impressive challenge for the future. The primary purpose of this program is to help provide the best educational experience possible for female undergraduate and graduate students by fostering a sense of community in the ECE Department and to provide opportunities, resources, services, and events of interest to current ECE students. Students participating in WECE will benefit from peer mentoring, career information, and exposure to industry role models, as well as extracurricular activities and social events throughout the year. Membership in the program is free and there will be a number of opportunities for interested students to sign up, as well as WECE-sponsored events for students to attend. This program is dedicated to the recruitment and retention of women engineering students at the pre-college, undergraduate, and graduate levels, and promoting the role of women in the field of engineering.